The Sunpan Flato Round Coffee table makes a crisp and clean centerpiece for a modern, contemporary, or industrial space. This sophisticated table features a simple European-inspired design perfect for showcasing art or collectibles. 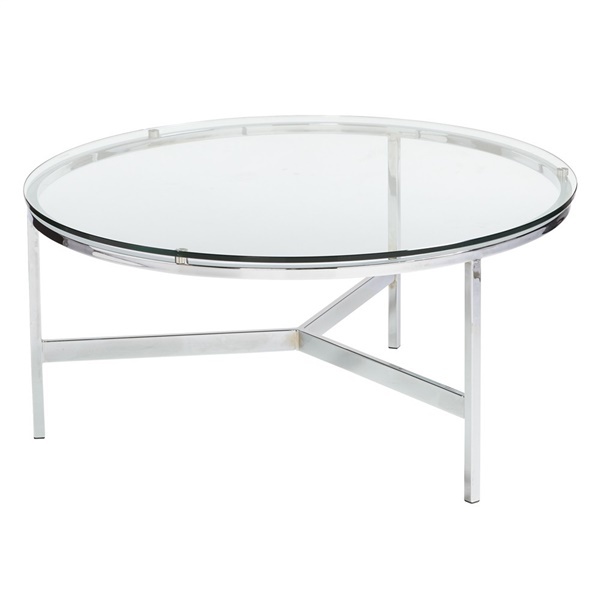 This table features a sturdy and durable chrome steel base with a distinctive three-legged design and a polished finish for a touch of contemporary shine. The top is crafted from thick 10mm glass, which has been tempered to ensure safety and durability. This table makes an excellent centerpiece for a living area, but it also makes a bold statement in a commercial office, a hotel lobby, or a store. Use it alone, or pair it with the Sunpan Flato Round End Table.